It’s rather remiss of me not to have posted this recipe yet. The glitz and excitement of Global Feast, the Olympics and Paralympics have already faded as Autumn kicks us up the backside with its sudden chill and yet more rain. So what better to refresh the memory than a recipe that transcends that moment, staying with us well into the chillier months of the year. It is aptly seasonal, warming and British, but also light and full of the exotic spices that remind me of that hot and heady night back at the beginning of the Olympic celebrations. 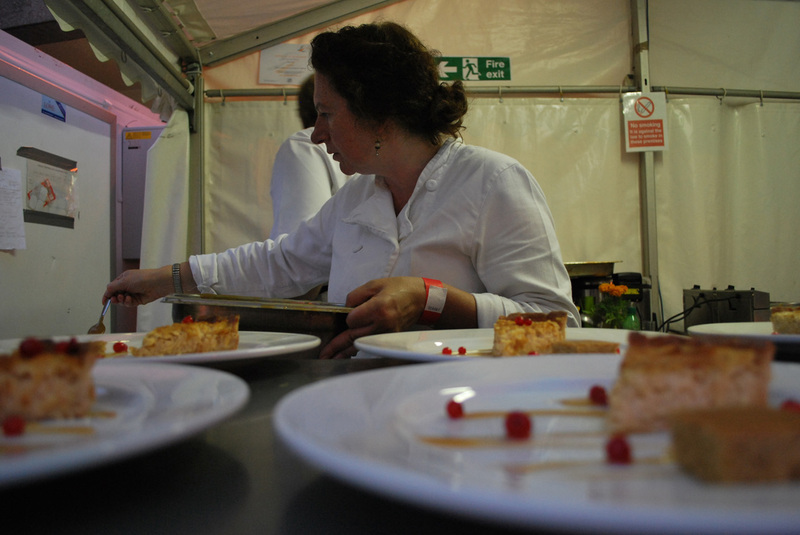 Sponsored by Penderyn Welsh whisky the dish was accompanied by a shot of their Madeira finished single malt. Whisky isn’t always my drink of choice, but this is to die for! Smoother than some whiskies and with the toffee and honey undertones, this is definitely my kind of whisky! So nice was it that I kept making people try it (even though it was only 10 am!! ), most claimed it was too early for whisky, but Kerstin (msmarmitelover) happily joined me for a taster. I’m no going to pass over the recipe for everything I served on the night. 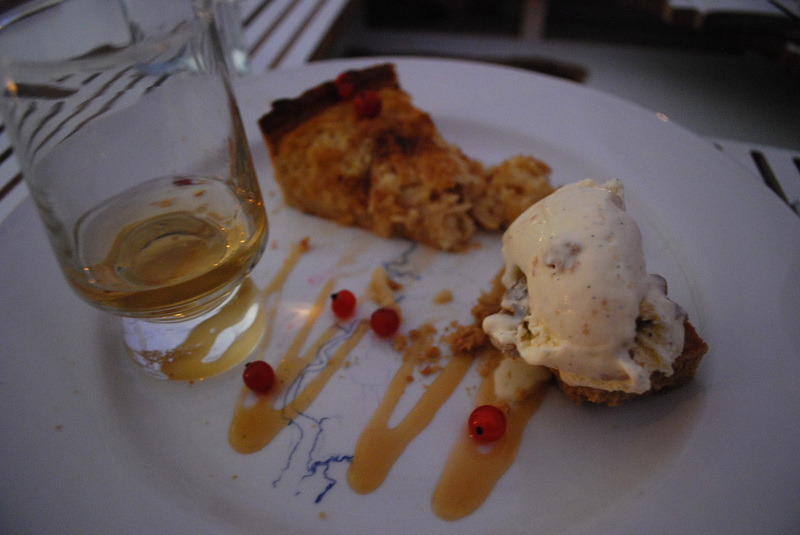 A simple slice of apple and cinnamon tart, a bit of ice cream and some salted caramel sauce is more than enough to satiate the sweetest tooth and topped off with a shot of that damn fine whisky the dish is complete. Soak the fruit in tea and whisky for at least an hour. Put the cream in a large heavy bottomed pan and heat gently. Scrape the seeds from the vanilla pods out with a sharp knife and add to the pan along with the pods. Heat until it just starts to come up to boiling point then remove from the heat and allow to infuse. Beat the egg yolks and sugar in a large bowl for about 5 to 10 minutes until pale and thick. Remove the vanilla pods from the cream and pour a little of the cream on to the eggs. Whisk slowly to mix in then continue adding the cream until it is all combined. Return the pan to the heat and cook slowly stirring constantly until thickened. Once it has thickened pour the mixture into a large cold bowl. It needs to cool quickly to stop the egg over cooking and to speed up this process you can also stand the bowl in a washing up bowl full of cold water or ice. When cold transfer to an ice cream machine and churn until almost frozen. Once the ice cream starts to thicken crumble in about 100g of cooled bara brith, plus an extra shot of whisky (if required). Serve with the apple and cinnamon tart. Melt the butter, sugar and syrup in a heavy based saucepan. Bring to the boil and simmer for about 3 or 4 minutes. Add the cream and vanilla salt and give it a quick stir. Test to see if it needs more salt. Cook for another minute or so and then remove from the heat and transfer to a jug. Now, this isn’t really a Welsh recipe, but it does reflect my Kentish origins. I grew up in the garden of England before decamping to Wales so I suppose in a way i’m fusing food from my English upbringing with the Welsh produce that influences my cooking now. This recipe is really a variation on Canterbury tart, very traditional down that way! Coarsely grate the apple into a large bowl and mix with lemon zest and juice. In a separate bowl beat the eggs and caster sugar together for a couple of minutes. Add the melted butter, cream and apple mixture and a couple of pinches of cinnamon. Carefully fill the pre baked pastry case (see above) with the mixture. 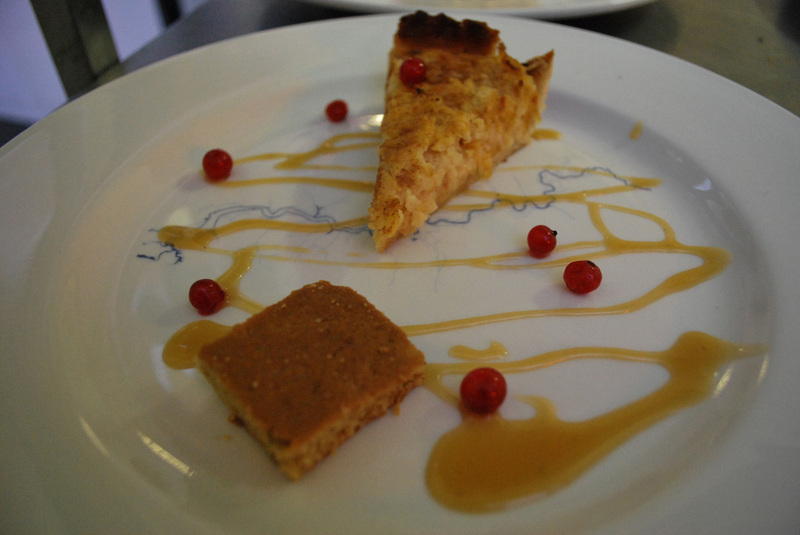 Mix the Demerara sugar and extra cinnamon and sprinkle it on the top of the tart. Bake in the oven gas mark 6/200 degrees C for about 40 minutes (maybe less) until the apple looks soft and the top is golden brown and set.